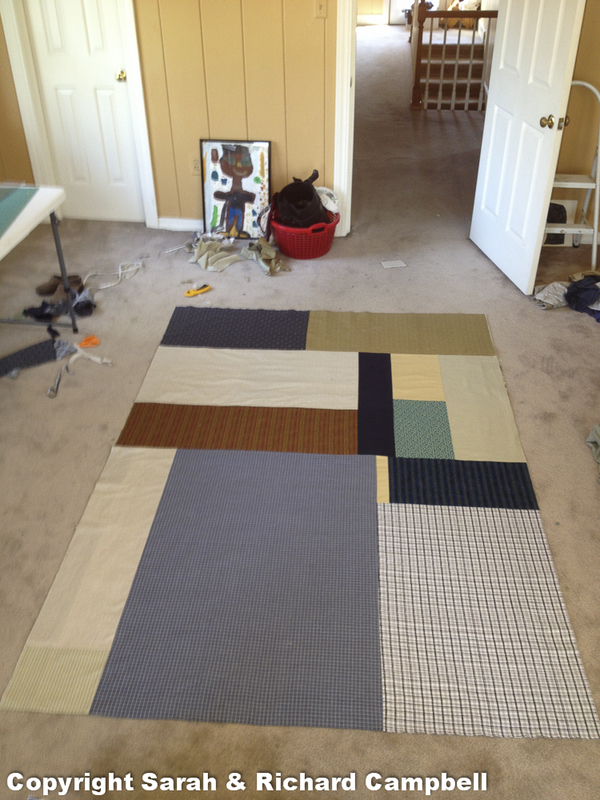 Those of you who know me well know than when things get tough, I start quilting. 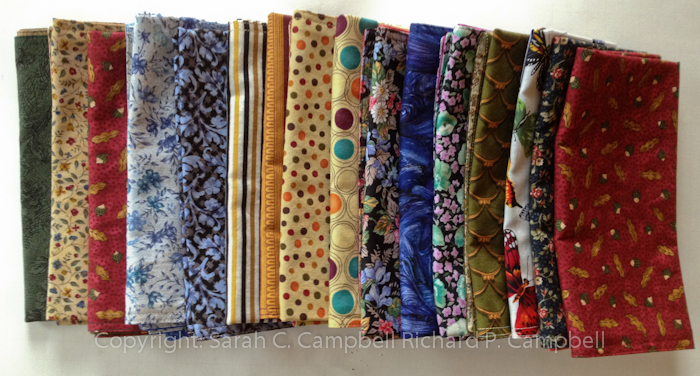 I often head to the sewing room while I wait for revision notes or when a day seems dark for no apparent reason. 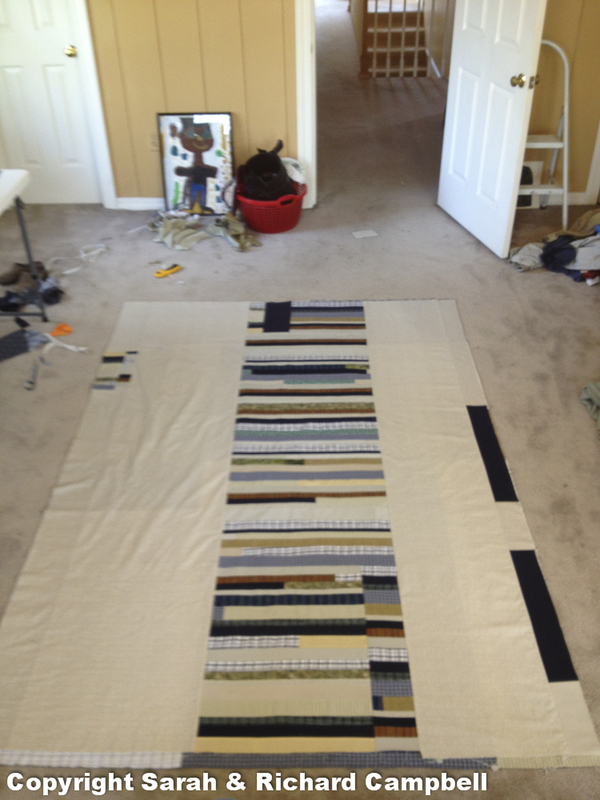 This spring I’ve been working to finish a quilt for my oldest son to take to college. What you see below was going to be the back of the quilt, but he likes it so much, he wants it to be the top. Here’s what the top looked like. I’m re-visioning it as a quilt for me to keep. I used fabric from his school uniform pants — khaki and navy. The top he’s going to get only has one piece from the trouser pants. It’s the navy piece near the middle of the upper third of the quilt. Sometimes things work out differently than you think. But it’s all good. 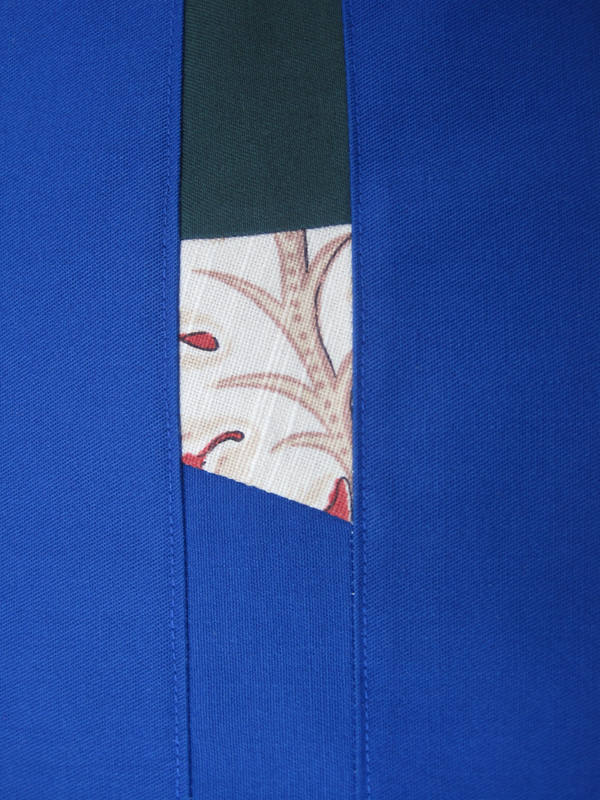 I’ve now slashed this top about a third of the way up and am turning it around so the central panel has a jag in it. I’ll post new pictures when I finish it again. It’s all a process, right? Richard got a Konova slider for Christmas so he decided to try it out yesterday afternoon. 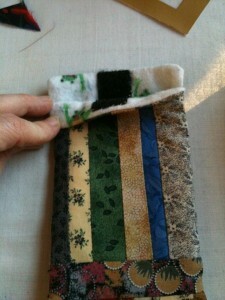 My friend Elizabeth came over to sew, so he decided to capture some of our work. Sewing from richard campbell on Vimeo. I’ve been making napkins as gifts for family members and fundraisers, but I never have gotten around to making some for me. Until now. I’m so eager to use them, I’m thinking about organizing a party. Or, maybe I’ll just put them out for an everyday meal. A Homemade Tablecloth, Math Required! I made this for my mother-in-law for her birthday. (Shhh! all you family members who are online.) 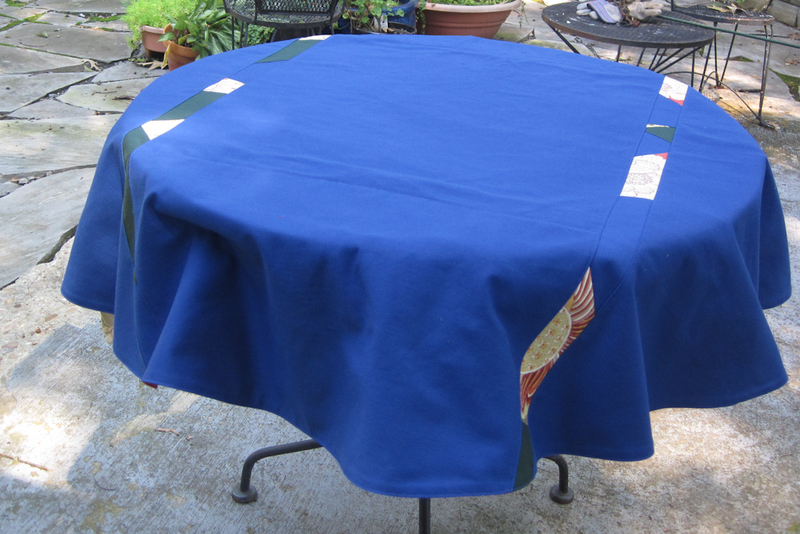 I was a little hesitant to try a circular tablecloth because I thought it might to too tricky to execute. 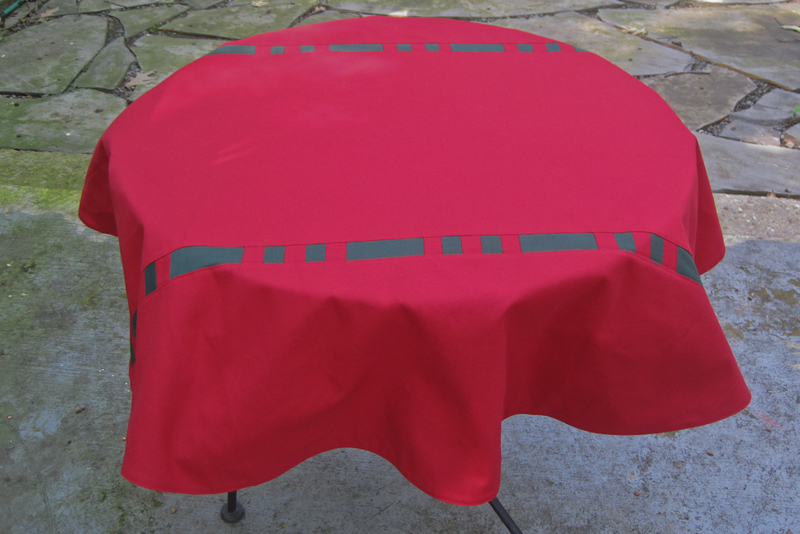 In the end, I designed this, a reversible tablecloth made from home decor cotton/poly fabric. My father-in-law gave me the diameter of the table. I wanted the tablecloth to have some overhang. I used a little geometry and rigged a compass-like device with a thumbtack and tape measure to trim the round shape. This is the side for everyday use. This is the side for the Christmas holidays. Here is a detail shot of the Christmas side. 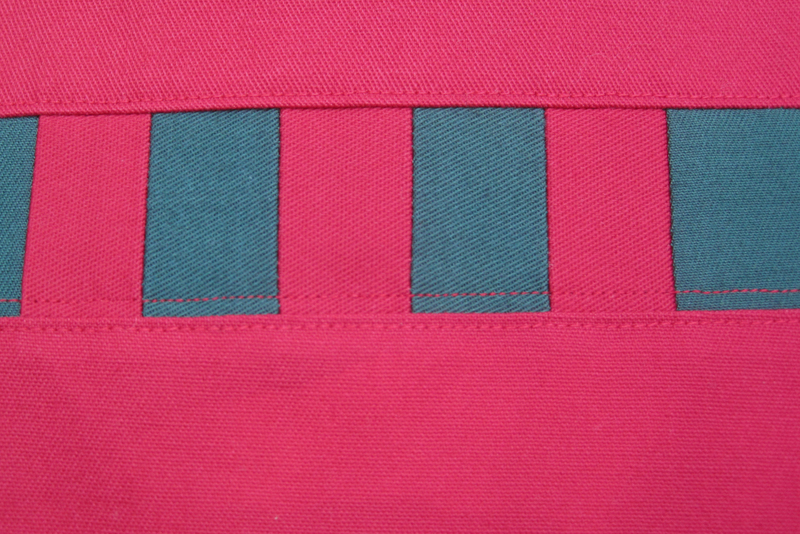 Having the right color thread is crucial for good top-stitching. I am stewing about my work-in-progress. I heard back from one of my trusted readers and the news wasn’t all good. I need to do some hard thinking about this story and how I want to tell it. I’m past figuring out “if” I want to tell it and I’m pretty sure it can be a picture book, but I am going to try a few things before I’m ready to let it go out again. One of the things I need to do is get really analytical about it. I need to dummy it. I need to take it back down to brass tacks. So, what did I do today, you ask? 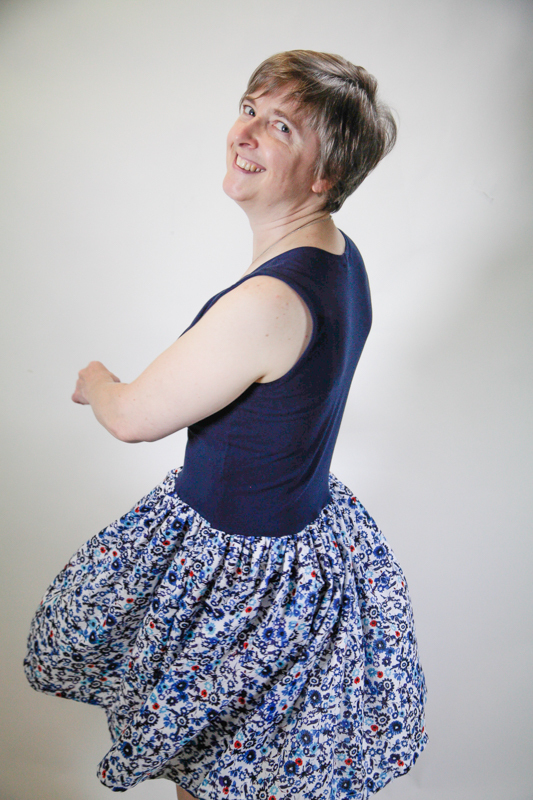 I high-tailed it up to my sewing room. 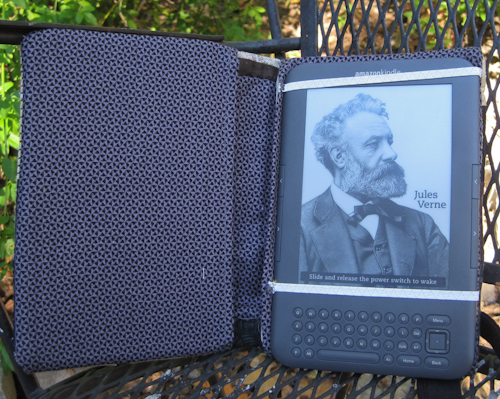 I got a Kindle for my birthday. My husband, the giver of this wonderful gift, almost immediately appropriated it for his use. 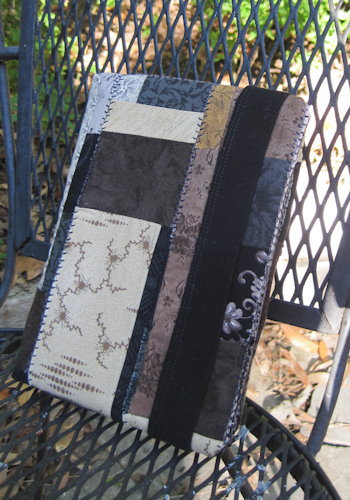 I decided he needed a cover for my Kindle so I spent a few hours today making one. I’ve had this piece of patchwork in the sewing room for a long time. I finally found a good use for it. The strap around it is leftover from a hemming project for my mom. The cardboard inside came from a freebie legal pad cover. Lots of re-purposing going on. Now, I’ll just have to break it to Richard and I’ll be reading some books on my Kindle. I hope he lets me borrow the cover. I’m glad I went outside to take these photographs because it is a gorgeous day. I noticed a beautiful butterfly in our butterfly garden. It looked for all the world like a Monarch, but I can’t be sure. Sewing always helps me clear my head for work. I made the above piece recently as I was working through some difficulties with my current story. Spending time handling fabric, calculating lengths, sewing, trimming, and hemming is like brain food. A good friend got this for a birthday present, but it was a gift to me, too. It is the second in my “Not White” series. My sister, Jessica, got the first piece for Christmas. Now that I’ve mentioned it, I’ll tell you more about my current story. I’m writing a picture book that centers on an event in my early life. It’s set in 1973 and is quite a departure from my two previous books. I won’t be illustrating it with photographs and it can’t be called nonfiction. It’s full of dialogue. I pushed really hard to get it ready by this week so I could send it for critique at the fall conference of Southern Breeze region of the Society of Children’s Book Writers and Illustrators. Registration is open for the conference, which will be held in Birmingham on Oct. 16. If you think you might want to write magazine pieces or books for children, please come. 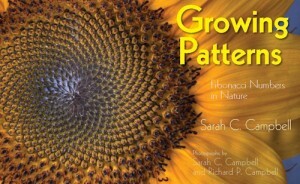 On the blog Moms Inspire Learning, the writer suggests pairing the book “with a nature walk to count the petals on flowers, or children might enjoy examining actual pinecones and pineapples.” See the full entry here. What do you think of my new bag? 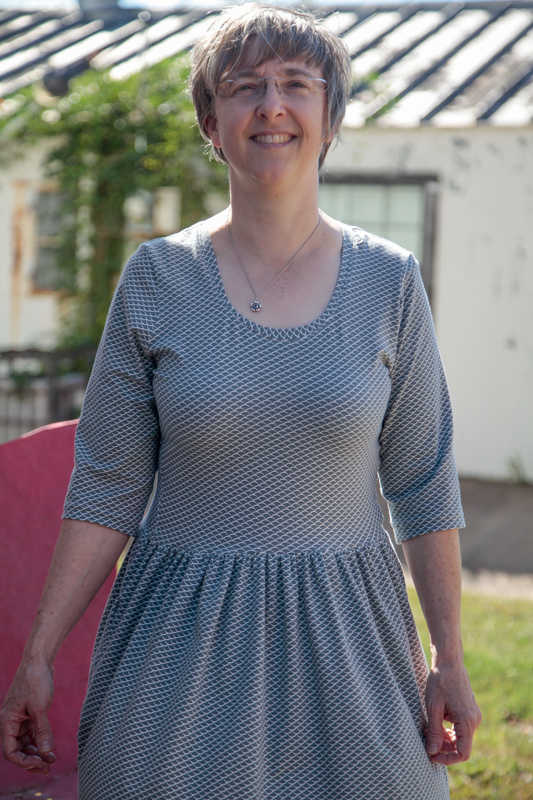 I had a ton of fun putting this together during a sewing session with my friend, Julie. She spent the time working on pillow cases. When she posts some photographs, I’ll link to them here. Visit Sew, Mama, Sew to see the pattern and instructions. 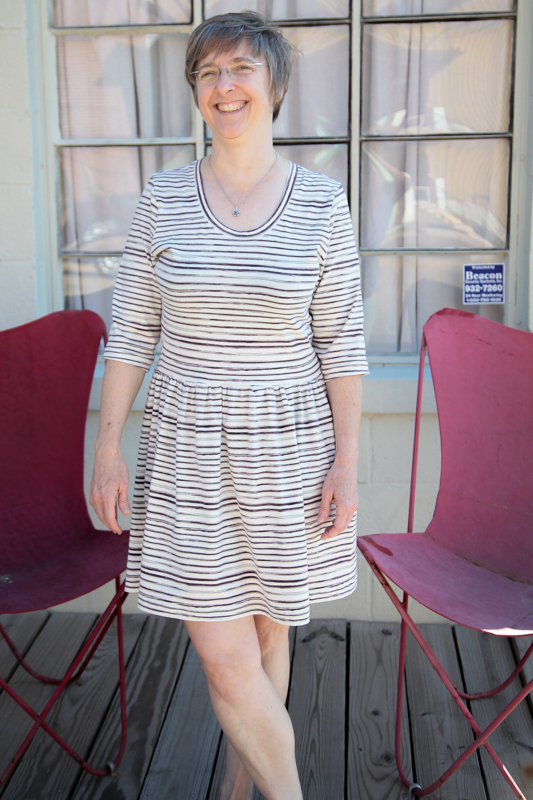 The pattern calls for using a single piece of fabric, but I am fairly obsessed with stripping. My other purse, which I did using a string pattern, was starting to show some wear. Plus, I thought it was time for a new style. Everything I used to make the bag was already in my sewing room. 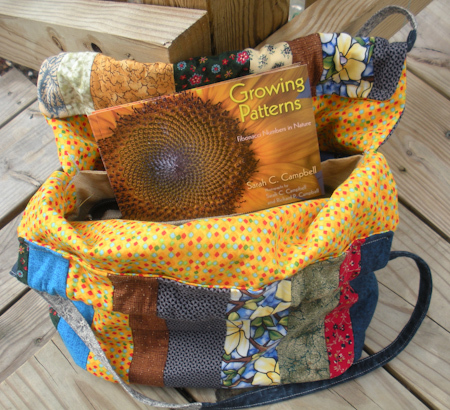 Another view of the bag shows what I was carrying around today: postcards for Growing Patterns: Fibonacci Numbers in Nature. Isn’t the sunflower a perfect accompaniment for a bright spring bag? 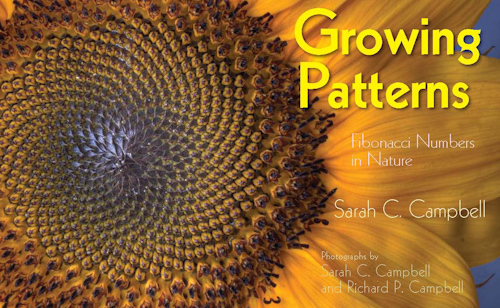 Speaking of Growing Patterns, I have added some activities to my website for teachers to use in classrooms where they and/or their students are reading Growing Patterns. Jessica and I spent the afternoon in the sewing room yesterday, whipping up little covers for our igadgets. I made mine from leftover quilting strips. Jess used some silk scraps she got for Christmas. I lined mine with flannel from my youngest son’s baby blanket — you can see the frogs. Jess chose some red velour (which was leftover from remaking my oldest son’s stuffed kitty) to line hers. I don’t have a good picture of Jessica’s. I’ll have to see if my mother can provide one. She walked in as we were finishing up. It was nice to have an afternoon together sewing. The boys wandered in and out with their music and dueled with cardboard rolls that once held wrapping paper. When I went back upstairs to the sewing room, I noticed that Jessica left some of her scraps behind — maybe enough for me to do something with. You must have noticed that I don’t throw much away if I still have scraps from Douglas’ baby blanket. 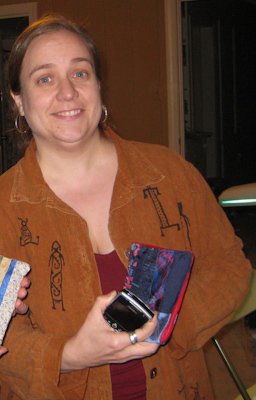 I love the motifs on Jessica’s shirt. That’s one of my new crafting goals — to work with printing on fabrics. I’ll keep you posted on that.